Had More Plastic than Fish? Plastic is now found in almost every marine area on Earth, and the problem is getting worse every year. But the solution is in our hands—join us and aquariums across the country in choosing reusable alternatives over single-use plastic. The New England Aquarium is joining forces with aquariums across the country out of concern for our oceans and fresh waters. The Aquarium Conservation Partnership (ACP) is a first-of-its-kind collaboration of 19 U.S. aquariums that have joined together to take collective action on science-based ocean and freshwater conservation priorities. Our collective Aquarium Conservation Partnership is pledging to reduce the sources of ocean and freshwater plastic pollution amid an alarming and growing problem of plastics in oceans, rivers, lakes, and bodies of water around the world. The solution is In Our Hands! Just how big a problem is plastic pollution? Plastic production has grown from 15 million tons in 1964 to 322 million tons in 2015. The U.S. produces 44 thousand to 121 thousand tons of plastic a year, and U.S. consumers generate more plastic waste per person than any other top plastic polluting country. Currently, the U.S. is also 20th on the list of ocean plastic pollution-generating countries. If current practices continue globally, plastic input into the ocean is expected to double worldwide by 2025. All that plastic wreaks havoc on ocean animals and ecosystems. Nearly 700 species of marine animals are known to be impacted by marine debris, most of which is plastic. Fifty-two percent of sea turtle species worldwide have ingested plastic. It’s estimated that over 99 percent of all seabird species—and over 90 percent of individual seabirds—will have ingested plastic by 2050. Plastics, and the associated toxins, can also work their way up the food chain into our food, and research is still being done on the effects of this on humans. So what can we do about the problem of plastic pollution? From disposable beverage bottles and plastics bags to straws and coffee cups, the plastic problem is literally In Our Hands! We have the power to help reduce ocean and freshwater plastic pollution. Communities around the world participate in beach cleanups to remove plastic waste from coastal environments. Curbing litter and improving waste management is another way to prevent plastics from flowing into the ocean through stormwater drainage systems. Recycling can also reduce the chance that plastic waste will be leaked into the aquatic environment, although recycling continues to lag significantly behind the rate of plastic production in the United States and around the world. Another thing consumers can do to reduce single-use plastic packaging is to demand more-sustainable alternatives, especially for consumer goods like food, beverages, personal care products, and household items. You can also refuse to use many single-use plastics. Tell your server you don’t need a straw with your drink, sip straight from your cup at a cafeteria, search out paper or reusable straws to use when you’re on the go, and bring your own reusable coffee and water bottles. Refuse plastic bags when you’re shopping and bring your own reusable totes to use instead. Here at the Aquarium, we are committed to reducing the amount of plastic being used at our facility. We have already eliminated many single-use plastic items from Central Wharf. Our Café provides biodegradable straws, cutlery, cups, and plates. And our gift shop and photo souvenir program offer paper bags. You can even purchase reusable tote bags (and water bottles, coffee mugs and more) in our gift shop! We are also committed to working with our partners to significantly reduce or eliminate single-use plastic beverage bottles by 2020, and providing innovative alternatives to single-use plastic for our visitors. Learn more about the ACP and our collective commitment to reducing single-use plastics, and find out what you can do to join our campaign. 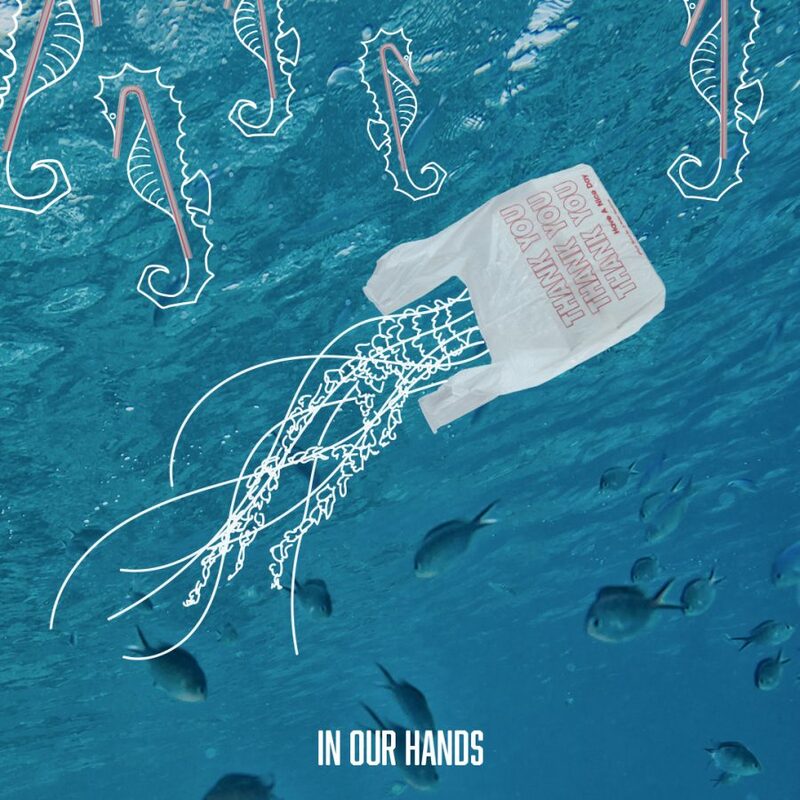 The solution to plastic pollution is In Our Hands!